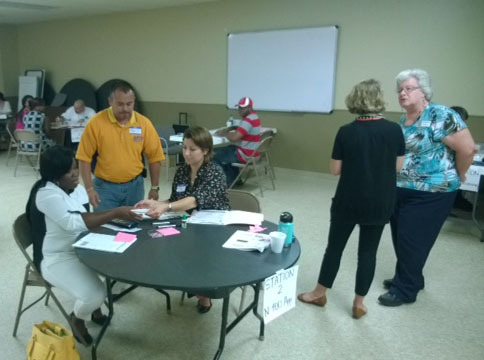 On August 23, 2014, UFCW Local 431 Cargill workers attended a UFCW Union Citizenship Action Network (UCAN) workshop in Beardstown, Ill. The workshop focused on legal services, the process to become a citizen, and other immigration and citizenship issues. Nearly 75 people attended the workshop and 22 people received assistance filling out their naturalization applications. This will start them on the path to becoming U.S. citizens. Nearly 40 participants from UFCW Locals 2, 293, 400, and 431 participated in the first training of the UFCW Immigration Integration Project in Dodge City, Kan., from May 21-23. The three-day training, hosted by UFCW Local District 2, provided the participants with the platform to learn from seasoned immigrants’ rights advocates about the critical skills and tools needed to assist eligible UFCW members and their families to go through the naturalization process to become U.S. citizens. In addition to learning about the naturalization process, the participants were also trained in providing assistance to workers or their family members who qualify for immigration benefits under the Obama Administration’s June 2012 memorandum on Deferred Action for Childhood Arrivals, commonly referred to as DACA. The training in Dodge City, initiated by the UFCW International Civil Rights Department, was held in coordination with the AFL-CIO and nationally-recognized immigrant rights advocacy groups, including the National Partnership for New Americans (NPNA), the Coalition for Humane Immigrant Rights of Los Angeles (CHIRLA) and the Massachusetts Immigrant and Refugee Advocacy Coalition (MIRA). Kansas-based local community advocacy groups also participated in the training. “We have so many members who need help navigating our complex immigration system and I am happy to have this opportunity to learn how to help UFCW members and their families apply for U.S. citizenship and take advantage of other immigration benefits they qualify for,” said Bozi Kiekie, a UFCW Local 431 member who works at the Cargill plant in Beardstown, Ill.